I am now going to talk about the general gameplay and what the player (you) need to do to succeed. In the first episode there is no course of investigation as all you need to do is complete the trail and learn the basics. How you do is a trail is by listening to the witness testimony and trying to find contradictions with the evidence provided, However if no evidence is at first available the player can press the witness for more information to uncover clues or new testimony. The player has a life bar gauge that decreases every time the player either gets a question wrong which can be given out by the judge or the prosecutor or by presenting the wrong evidence to the wrong statement. The life bar is refilled to full when the player completes a trial and moves on to the next trial segment. 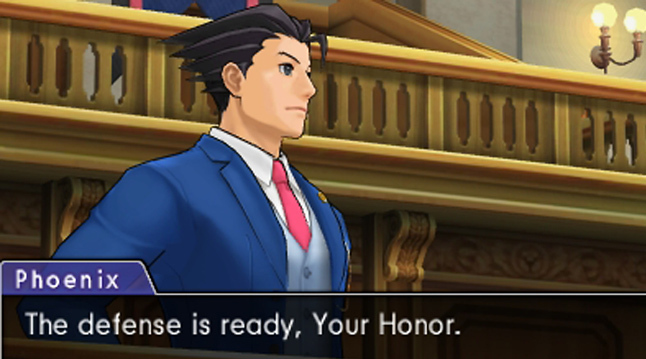 If you are new to the franchise then you will not know about Apollo's bracelet which allows the player to carefully look at the witness to look for a certain habit in a statement which can be very frustrating to find at times. The game has unlockable episodes and costumes for the characters which cost money. I myself have to yet to play the episodes but from what I have learned it is worth it. In my opinion this game was filled with beautiful animations and superb voice acting and I am glad I bought this game because of the new characters and new ability you can use when the situation arises. I would suggest buying this game as it is a great addition to the ace attorney series.